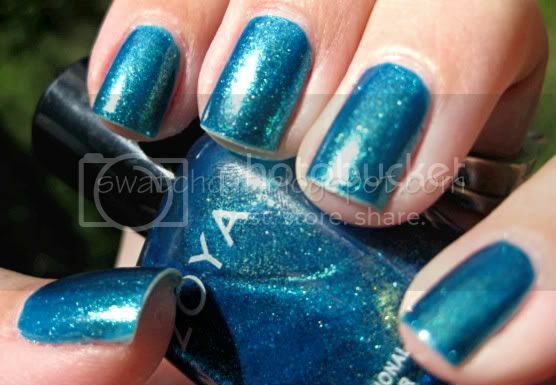 Zoya's Sparkle Collection. I just can't say enough about how pretty this collection is. It's so pretty and, well sparkley! The polishes look like they have shiny foil bits embedded, almost metallic, very summery. I couldn't stop staring at my nails, which can be quite hazardous when you're driving. This collection is seriously drool-worthy. Lot's of pictures ahead, so get your bib ready. 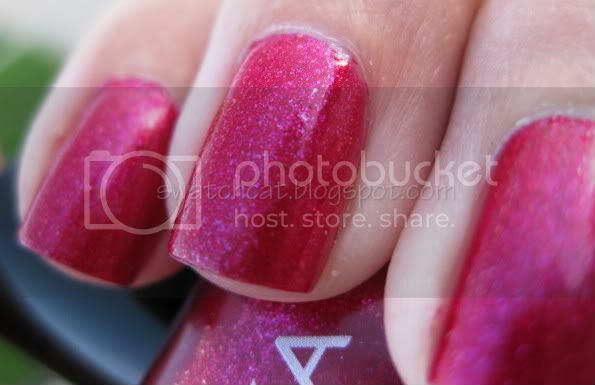 Alegra is a beautiful magenta with sparkles that flash red, lilac, pink and gold. It absolutely glows on the nails. Even though it's bright and sparkley, it's really wearable, and work-friendly, unless you're in a super-conservative office. See the rest of the collection after the jump. 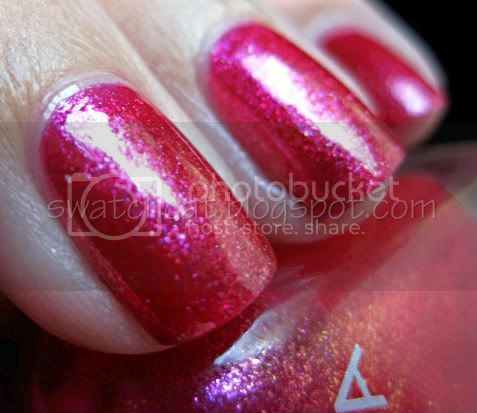 Gilda is a pretty flamingo pink with sparkles that flash red, pink, lilac and I also detected some gold. Think of it as Alegra's lighter, brighter sister. 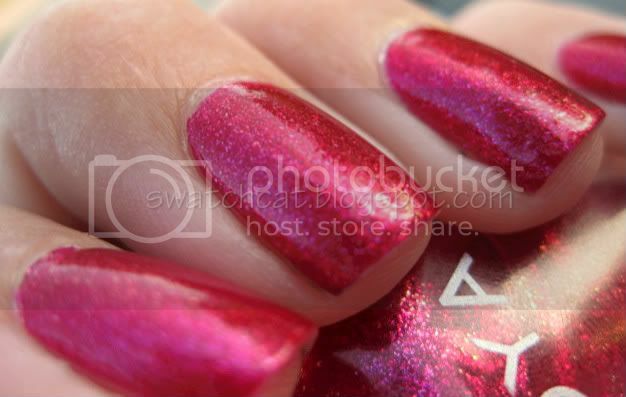 This one, again, just glows on the nails, and is one of the more work-appropriate ones. Ivanka is an amazing money-green (methinks this name was not random) with sparkles that flash gold, turquoise, and also a little violet. I did this mani before I went hiking, and I stared at my nails all the way up and back down the mountain. Ivanka is just mesmerizing and definitely a favorite from this collection. Mimi is a freaking gorgeous blue-violet (remember that Crayon - it was my favorite!) with sparkles that flash pink and gold; it's a little less blue than as photographed. Definitely my favorite of the bunch, and it matches my iPod Nano, which is an extra bonus. Oh, did I mention it's freaking gorgeous?! Plus it's purple and pink!! And in the sunlight, it really pops and glows against my skin. It's amazing. You need Mimi. You need it now. 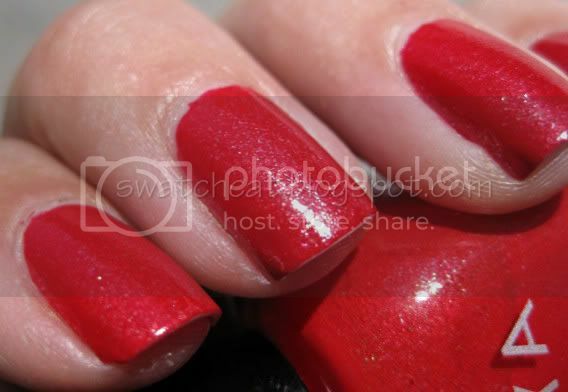 Nidhi is a juicy tomato-red with sparkles that flash gold, pink, and turquoise. Nidhi has the least obvious sparkle of the bunch. I really tried to capture the turquoise flash, but it was only visible (to me) indoors under lower lighting. Definitely the most office-friendly of the bunch since it really looks like a standard red at first glance. But then you do a double-take and realize it's awesomeness. I apologize for the few blurry pictures. The sparkles in the sunlight really messed with the camera focus. 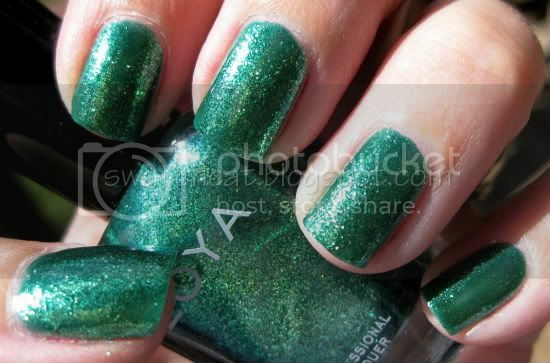 Formula on these is pretty great, the standard Zoya. I used three coats to achieve mostly opaque coverage, although there is a little VNL on the lighter colors and in the sunlight. I wasn't bothered, but a fourth coat would probably take care of it. 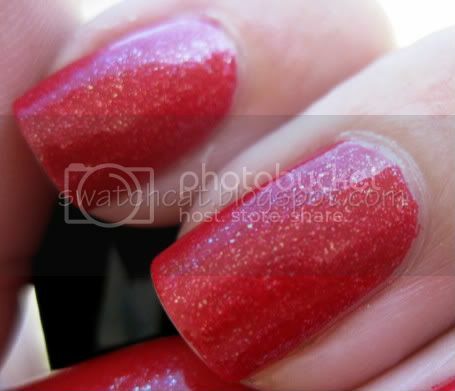 The entire Sparkle Collection is available for purchase at Zoya. Singles are $7 or $36 for the set.